Below is an excerpt from the Introduction of our book Startups Made Simple: How to Start, Grow and Systemize Your Dream Business. Learn more about the book here. Imagine the perfect business for you. Imagine that you could take that vision and systematically, in clear simple steps, make it a reality while saving time and avoiding the mistakes that destroy most startups. Creating a business is the greatest source of personal freedom, wealth and progress in the world. Nearly three-quarters of the Forbes 500 Richest People are on that list because they own a stake in one or more businesses. And the majority of those people are “first generation” – they didn’t inherit the wealth, they created it. I believe the future of humanity’s progress will be led by entrepreneurs. Think of all the entrepreneurs working on everything from space exploration, renewable energy, easier ways to get a cab, or even a better or faster meal. These people are making the world a better place through their business. This is the power of entrepreneurship: You can create fantastic wealth while helping people and even help solve the world’s problems. This book is a guide to take the entrepreneur from an idea to a real, profitable and systemized company (one that allows you to take a real vacation) as fast and easy as humanly possible. My intention is to make this book the best and most concise guide for entrepreneurs starting a business in the real world; especially for those without a lot of resources and connections. This book deals very little with pitching investors, going to conferences, or other things that are popular with “wantrapreneurs” who seem to do everything but actually build a business. My focus is on the bootstrap entrepreneurs that start real businesses every day. In reality, less than 1% of startups get venture capital funding. Silicon Valley types like to disparage these small businesses as a “lifestyle business” with “only” $1 million dollars per year in revenue or less. It’s amazing; they’ll congratulate you for raising $1 million in funding but not actually making $1 million in revenue. However, most of these small business owners work damn hard and deserve the freedom that a well-run business can provide. Silicon Valley also seems to be obsessed with writing books, articles, and more about best practices that only seem to apply in hyper-competitive, well-funded businesses that basically have a monopoly (Google, Microsoft, Facebook, etc.). Many of these companies are nothing like 99.9% of businesses in the real world. For example, most small business owners just need good, reliable employees that show up on time. These small businesses cannot afford stock options, catered lunches, free daycare, massages, personal development training and the many other things required to compete in the ultra-competitive job market of Silicon Valley and other tech hotspots. There are also literally thousands of small business books available on Amazon and other places, but what I’ve found is that the vast majority of them 1) over-complicate things, usually so they can sell you their consulting or other services, and 2) should not be books at all. They should be articles because the concept is simple and the author has padded the information with endless stories and examples to make it book length. These are huge pet peeves of mine, so I hope to avoid both issues in this book by presenting the information clearly, minimizing fluff and filler, and providing clear and simple action steps and checklists every step of the way because I assume you’re as busy as any CEO. Minimizing wasted time and unnecessary risks for a startup is the entire point of this book. This is the book I would give my friends and family to most ensure their success. I founded MyCompanyWorks, Inc., from my apartment with less than $1,000 in 2001. This was in the middle of the “dot com crash” and one month after 9/11, so the economy wasn’t exactly what I would call optimal. Since then, we’ve helped over 50,000 entrepreneurs start their business. In that time, we’ve never taken a loan or venture capital, never had an unprofitable year, and have been honored to make the Inc Magazine INC5000 fastest growing companies in America list. More importantly, I’ve made almost every mistake in the book (and continue to make mistakes!). There’s nothing special about me except perhaps my intolerance and embarrassment over screwing up so much. I’ve left millions of dollars on the floor and have damaged relationships and my health because of the many poor decisions I have made through the various phases of my company. I don’t want you to make the same mistakes. I also personally know many successful entrepreneurs and have spoken to thousands of them as our clients about their successes and failures. I consider this topic to be my wheelhouse and constantly devour any information I can find on startups and small business management. This book contains the distilled wisdom from my experience and that of many others. More importantly, I’m obsessed with what makes a startup succeed and how to simplify this into a system that can be replicated. There are many companies that are much larger, make more money, and have a greater impact on the planet than mine. But, one of the things I emphasize in this book is that you want to start the perfect company for you, not what others expect or want. It’s silly to want anything else. I’m perfectly happy with my business the way it is and would hate anything much more complex or “corporate.” I don’t like constant meetings, complex business models, or a difficult-to-manage business. But that’s just me. Today, my business is systemized, requires little supervision, and grows consistently. I choose when to work or go on a vacation when I want, and I’m in the best shape of my life. The business continues to generate income and wealth while I am free to work on the big-picture projects or not work at all, depending on my mood. In my opinion, wealth, freedom, and making an impact or helping other people via your business is a peak life experience, an experience I’d like to help others attain. Unfortunately, the statistics for new business startups are pretty grim. Depending on the source of data, you can expect at least a 50% failure rate within a few years (these statistics are more or less the same worldwide). Some sources place that number as high as 90% after 10 years. In addition, 96% of businesses never break $1 million per year in revenue. These startups never get past a few employees because the entrepreneur is in their own way and doesn’t plan, communicate, or systemize. One thing I’ve noticed is that there are many ways to succeed in business. You can succeed via a good plan, lots of funding, a great idea or product, luck, good timing, good economy, connections, or many other things (usually combinations of those things). However, it seems that one big key to success is simply not making the big mistakes that seem to be common among startups. So, instead of focusing so much on what you need to do to succeed in your startup, we’re starting to find out that a lot of doing well in business (and life in general) is simply avoiding the bad habits, decisions and situations that have continually proven to lead to bad results. Basically, it’s easier to learn from the mistakes of others than it is to make all those same mistakes yourself. This concept is called via negativa (popularized by the book Antifragile by Nassim Taleb) and I use it frequently throughout this book to make you aware of the well-known startup and small business management mistakes. Personally, I’ve made a number of huge mistakes that have wasted a lot of time, energy, and money, literally millions of dollars as I’ve mentioned. Sure, I’ve learned from them and they were valuable lessons but some were easily avoidable with even a basic amount of planning and preparation. If you’re going to start a business, you might as well do some quick planning now to save you hundreds of hours of heartache down the road. Don’t over-plan, but don’t go into the process blind. The great thing about business is you can attempt as many times as you want, but you only have to succeed once to be set for life. There are a lot of misconceptions about startups these days. For example, did you know that the average age of a successful startup founder is 45? From all the hype you see in media, you would assume all the successful founders are barely out of high school or in their 20s. As I’ll show you in Part One of this book, there are founder skills that are critical to success and older people tend to have acquired more of these skills over time. Or did you know that of those 90% of businesses that failed, up to one-third of those businesses were actually profitable? Yes, just like anything else, a founder can become tired of their business and might have simply closed it, sold it, or moved on. This dramatically changes our perception of the 90% failure rate mentioned above. The reality now seems to indicate a real failure rate of a bit higher than 50%, and I’ll take a 50/50 shot every time. Armed with those facts, a startup doesn’t look so daunting now, does it? What I want to do is add valuable planning, skills, and habits to the equation, and I believe this will dramatically improve your chances for success. Merely being aware of some of the landmines and best practices for startups should be incredibly helpful. Here’s the nightmare scenario: You’ve started your company, it’s making money, you’re working hard, and decide you really need a vacation. The problem is that the company is entirely dependent on you; you couldn’t take a vacation or even a sick day if you wanted. Suddenly, you realize that you haven’t created a company, you’ve only created another job for yourself—with no paid time off! Even worse, you are 100% responsible for everything and your customers are now your boss. You now have more pressure and stress then you did when you worked for someone else and are probably wondering what the point was. Trust me, I spent years like this. This is not an uncommon scenario. The vast majority of entrepreneurs are stuck in their business working on the day-to-day, and they work, on average, well over 50 hours per week. They don’t realize that they’re actually the bottleneck in the growth and systemization of their company. Whether you’re just planning or have already started your business, I will show you a clear way out of this trap. Many books like the E-Myth and others have covered this topic, but the basic truth is that most people know a skill or craft but don’t know how to build or manage a proper business with systems. Franchises like McDonalds and 7-Eleven almost always succeed because they have a system and an operations manual for each new franchisee/owner to follow step-by-step and has been proven to work. System is the key word here. Systems are the key to your freedom and will multiply the value of your company because it will not be completely dependent on you. I not only show you how to do basic planning from the very beginning, but how to lay down a framework for you to eventually replace yourself as your business grows—not to mention that systemizing a business is an incredibly valuable skill to learn and apply elsewhere. A business that does not have systems is in a difficult place. This “owner dependent” type of business usually hits crisis when the founder gets sick or needs to retire or sell the business. So, even if you don’t intend to be more than a one-person company or don’t intend to sell your company, I make the argument that you should at least have basic systems in place, if only for your own sanity. At the bare minimum, keep everything in the same place and some basic instructions for loved ones if there is some kind of emergency. Worst case scenarios aside, one thing I want to emphasize is that by “planning,” I don’t mean a 50-page business plan and a 200-page operations manual. Modern business planning focuses on speed, simplicity, and testing your idea before you do an enormous amount of planning – the plan I give you fits on one page. In the real world, most companies are started with more of a shotgun approach to validate the idea and get moving. Someone starts a website, a person starts charging for their shirts or consulting, etc. This has largely replaced complex business plans because the focus is on getting quick market validation so you can correct course quickly and not spend months and lots of money on a bad idea. Also, we won’t be building out a huge operations manual but will instead simply start documenting things in one document and let you organize things organically and systematically from the start. If you already have a business, then we’ll show you how to begin organizing things as well. Using this system, you should be able to grow your business to $1 million in revenue and potentially a lot more depending on the complexity of your business. Every business is different. We keep the system simple for people at that level and below. Once you exceed several million dollars in sales, then the complexity of your company will grow and may require additional systems, but I want to emphasize again that, while you should plan, there is no need to overplan and over-optimize things until you get to that level. This book has three parts. Part One covers what I’ve found to be the skills and habits of great founders that I call The Founder Superpowers. Imagine it. Whether you have a business idea in mind or not, this section will help you brainstorm and clarify your idea. We also work on a vision for the perfect business for you. Having a clear vision of what you want is the first step to making it real. Plan it. Using a simple one-page plan, we begin laying out what you need to test this business idea and then get it off the ground as quick as possible. Start it. An overview and simple checklist of things to do to get your business registered and legal. We also cover picking the business name, entity, taxes, and more. Grow it. Using another simple plan, we lay out the steps to help you identify your ideal customer to build your “sales machine” and grow your business. Manage it. We cover the five things you need to master to have a well-run business: the plan, process, people, tools, and routines. Systemize it. We put it all together and systemize your business into one simple system and continue simplifying and improving your business until it is essentially self-running. Part Three contains two scorecards to assess your skills as a founder and assess your company as a whole. I recommend you complete them after reading the book to get a baseline score. Everything in the first two parts should help you dramatically improve in these areas. Feel free to skip around if you are in a hurry or already have a business and need specific help in any area. Otherwise, I believe the book is brief enough to go from beginning to end, skimming what you already know. I use bullet points and checklists extensively and each section or chapter has resources for implementation. Take the time to go through the book and do the action steps. These things done properly should save you many hours of painful “make up work” later. It’s amazing, but most people will put more planning into their wedding than their life or business! Do a few hours of planning to massively clarify your thinking and build a business right, a few hours to save hundreds later. Thinking through important things for a few hours will put you ahead of 99% of the population on earth. My writing style is very direct and informal and can sometimes come across as “tough love” or even a bit harsh despite my best intentions. This is because I’d rather give you the real truth about business instead of some motivational nonsense that should be on a business poster (which is what I see a lot of in business books these days). Note that the Imagine it step can be applied to a new business or to reimagine your existing business (I’ve done this a few times, and we’re on our third company name! ), to brainstorm a new product or just solve some problems you have at your company or in life. We’ll start with one document I call the Startups Made Simple Planner. We’ll work with this planner from idea all the way to systemization. This document will be a godsend later in business, trust me. Download a free Startups Made Simple Planner at www.StartupsMadeSimple.com and make sure to keep all of your company startup and planning documents, plans, and notes together in one folder (either a real folder/binder or on your computer). 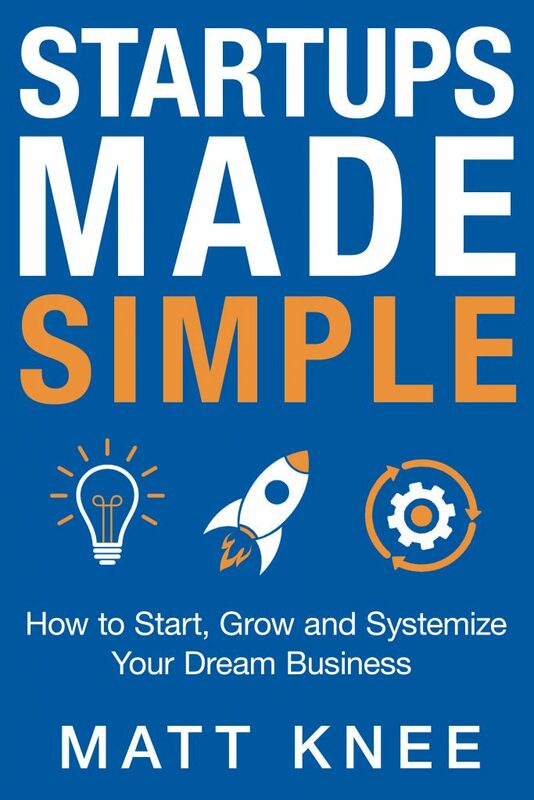 This was an excerpt from the Introduction of our book Startups Made Simple: How to Start, Grow and Systemize Your Dream Business. Learn more about the book here. This entry was posted on Thursday, March 28th, 2019 at 4:45 pm	and is filed under Small Biz Management, Starting A Business. You can follow any responses to this entry through the RSS 2.0 feed. You can skip to the end and leave a response. Pinging is currently not allowed.